DS Super Mario 64 DS (USA v1.0) in 08:52.64 by Sharkey91, ALAKTORN & MKDasher. This is an improvement of 5.76 seconds over the previous published run. 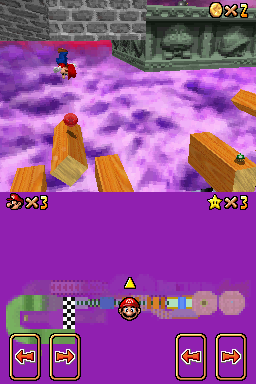 Most of the time saved comes from the new soft reset done at the beginning of the TAS, skipping the star touching animation, but also due to more optimization on most of the stars.